Adding human stories to geographical data. Connecting collaborators across disciplines and social perspectives. A collaboration platform for next-generation interdisciplinary scholarship. As the terrain for legal education shifts, law schools are looking across disciplines for new approaches to legal education, with a number of law schools recently establishing “law labs.” Professor Davis's article examines this new law lab movement, with a particular focus on the subset of legal innovation labs. Law labs were originally proposed as part of the legal realist-era law clinic movement, and there are many parallels between law labs and traditional clinics. For example, both law labs and clinics borrow terminology and specific methodologies from the sciences, particularly medicine, and both arise in reaction to the entrenched case method or podium classroom methodology in legal education. However, law labs and clinics are also distinct. The term “lab” has a specific cultural significance at a time when law schools are experiencing widespread criticism and critique, and lab processes includes methodologies that are new to law. 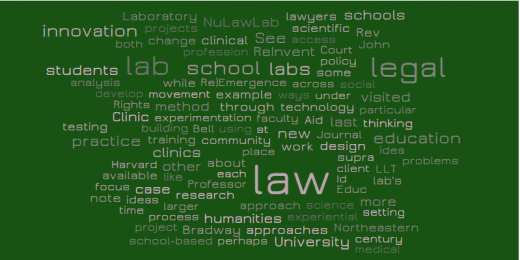 The article concludes with a focus on several legal innovation labs, includuing the NuLawLab, identifying the unique methodologies that these law labs seek to introduce – and institutionalize – in the law school setting. Published in The Journal of Legal Education, Vol. 65, No. 1, pp. 190-206, 2015, you can download the full article now on SSRN. Log in with your NuLawLab account. Forget your password?